have a few presentations left before graduation day, but no more class. reminds me of all the adventures I have to come. Well I hope you all have a wonderful Thursday! This look is so dreamy and romantic! I love you in maxi's! Great look!! LOVE your bag and heels!! Congratulations! I'm jealous. I still have a semester of student teaching ahead of me. Also, you skirt is simply wonderful. I love it paired with the heels. You look amazing. Congratulation dear ♥ While you finish it, I can't wait to start it! Unfortunatelly, I have to wait another year.. Anyway, I love this outfit. Very carefree and feminine, just like your state of mind, right ? I actually know just how you feel - I graduate next year and I'm already starting to get maudlin about it! I was right where you are a year ago. As proud as I was to complete my degree, I was sad to leave that part of my life behind. Congrats on being done :) It is a great accomplishment! Love the boho vibe! That skirt is so cute! You are beautiful and you have amazing clothes! First...LOVE LOVE LOVE this outfit, you look amazing! happy almost week of moving!! I hope you will enjoy it there. It will probably be a lot different for you in the winter time but I hope you will enjoy it. Philly is an hour and a half from me. Maybe if I ever go to visit my dear long-time friend I will spot you somewhere!! she lives in South Philly (although is moving elsewhere herself in philly somewhere). anyway I really love this maxi skirt!!! It is so sweet on you!! Yay! We've gained another Philly blogger! I still have one more year of college left and I'm ALREADY getting nostalgic. I can't imagine what I'm going to look like at graduation...haha probably a teary mess! That skirt is divine, you look so dreamy and beautiful in it! And the JS Dany's (which I love and am a proud owner of 2 pairs) with the adorable satchel make a fantastic pair. Best wishes for the move to Philly. Can't wait to see what more stylish adventures come your way, hun! Love this outfit! Those shoes are adorbz. ;) Congrats on finishing college. So exciting! gorgeoous skirt, looks fab with the JC's!!!!! Congrats on finishing your last day of classes!! I remember that feeling. Isn't it so surreal?? Now comes the fun part!! You look fab as always. 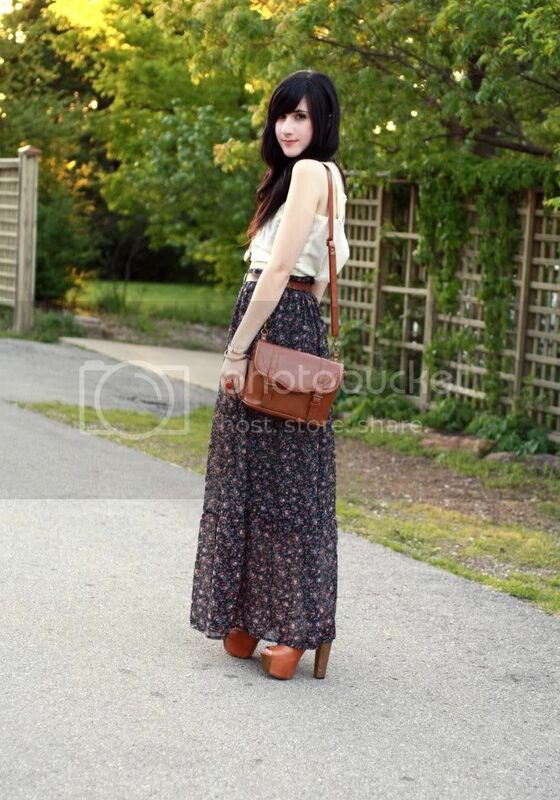 Love the long maxi, the cute bag, and your Dany heels! Oo last class ! Must be crazy!! and feel goood :P good luck with all the presentations before you're graduating! Loving the long skirt btw! woow your heals are amazingg and so is ur skirtt!!! oh wow the skirt is just to die for. you look so amazing in it. actually, the whole look is to die for! gorgeous. Oh the heels, the skirt, the lace, the leather.... what a great outfit!! LOVE the skirt!!! Check out my fashion blog!!! I follow back!!! Kisses! CONGRATULATIONS! Must feel good to be completely done going to class :) I hope you enjoy your new home. time sure is moving fast! you're not being dramatic. it feels the same for me. i only have 25 more days of high school left and it's all so surreal! on to your outfit, i love the skirt! 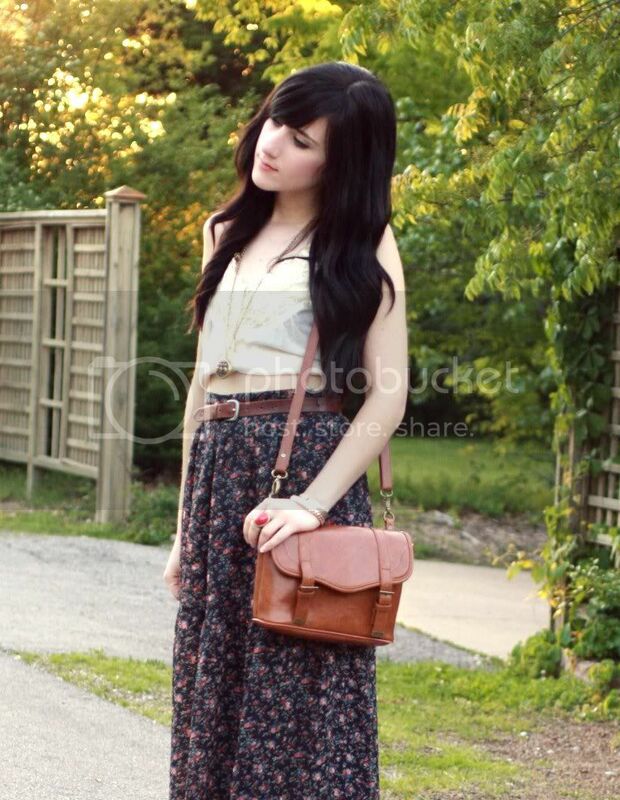 i really wish i was tall enough to pull off a maxi skirt. it's wonderful on you (: reminds me of a gypsy! So cute - I really like how your take on the 70's trend is still true to your style. So jealous you're done with school! I wish I was...one more month, agh! 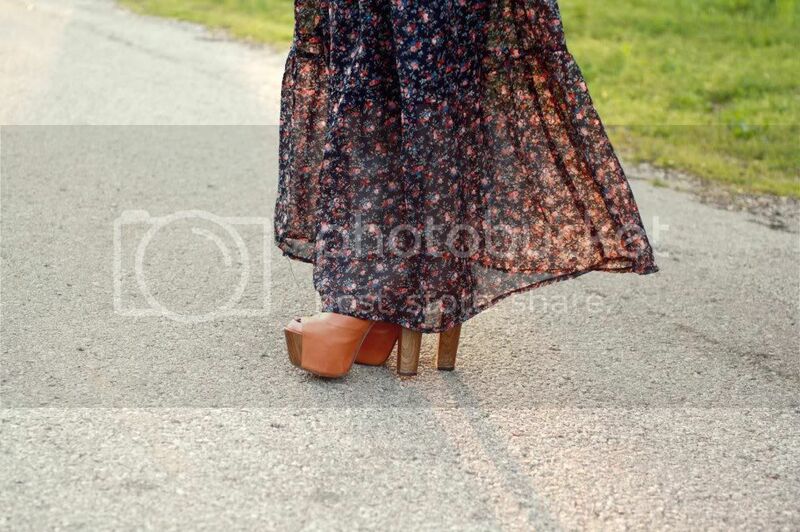 and I love this outfit, the platforms and the maxi skirt are so chic together! I'm excited for you! Finishing college is a big deal, so you're entitled to celebrate! congrats on the last day of college ever! i loveeee your purse and shoes! those platforms are so intense! you wear them so well! The skirt is so amazing! I love it so so so so much! haha. Congrats on finishing this last semester! We are going to have so much fun in Philly! See you soon! aww.i like your maxi skirt.so flowy. I still have two years left till graduation, but I bought an LSAT book today to start preparing for the test, and it kind of set in that time is gonna pass by really quickly. Hope your presentations go by well! Anyways, love your outfit. Gorgeous skirt, love that you paired it with that top! Very nice bag! Love your hair! congratulations honey, it is scary to be finishing but also exciting! im sure the next chapter of your life will be amazing and im looking forward to hearing all about it. also beautiful outfit, you pick the most gorgeous pieces and prints. Congrats! Love that skirt! And those heels! WOW! First off, congrats! How exciting! You look gorggeeeooousss as usual... :) Congratulations on completing college! That's fantastic! Good luck with moving and everything. Love your lovely maxi skirt ! the cropped top is really amazing ! You look adorable. You pull of the long skirt wonderfully! wow. that outfit is simply gorgeous. you look lovely. i LOVE that skirt, but your shoes - where did you get them from, they're amazing?! Can you please answer my emails? Love your look! You put together great outfits for every post. Wonderful !!! Love it, so natural and stylish. Congratulations on your last day! I can't even imagin how excited you must be! I could hardly even stand the excitement of my last day of the semester, hehe! you are gorgeous!! love this skirt!! aw you are graduating already!!! will be exciting to hear about your life after college! I absolutely love that maxi skirt Bonnie! And congratulations on your last day of college! :) That's so exciting! this look is pretty and definitely so bonnie! whoaa it must be fun to have no more class, i envy you. haha. i'm in love with your cute little top! Great skirt and those heels are amazing! oh wow...so much change! so much excitement! i love the hells poking out of the hem..so cute! I am in love with the skirt and shoes. Huge congrats on your upcoming graduation and best of luck in your next endeavors. Ahhh the beloved Dany's! I have a pair myself. They were made to be worn with maxi skirts.